What Happens When People—Rather Than Politicians—Are Given the Chance to Vote for a Higher Minimum Wage? Who decides the minimum wage? In several ballot initiatives next week, the people will. Next Tuesday, there’s one vote that looks set for a landslide victory. And the winner will be not a candidate but a number: a higher state minimum wage. You can tell how popular the upcoming state minimum-wage ballot initiatives are from the opposition tactics conservatives are deploying. They breathlessly claim raising the minimum wage will not help a significant number of workers, or in a contradictory argument, insist a minimum-wage boost would drive the state’s economy into ruin. Or they might try to erase it from the ballot altogether, as conservatives in Arkansas did in their lawyerly court battle over the signature-collection process to bring up a referendum for a minimum wage of $8.50 per hour. The state Supreme Court just ruled in favor of ballot campaigners, so now Arkansas will be among four Red-leaning states to offer a minimum-wage initiative, alongside Alaska, Nebraska and South Dakota (weighing proposals for base wages of $9.75, $9 and $8.50, respectively). Illinois will weigh a non-binding proposal for a $10 minimum wage. Two cities, Oakland and San Francisco will vote to hike the minimum wage to $12.25 and $15, respectively, extending a growing movement for wage reforms at the city level, inspired by Seattle’s trailblazing $15 minimum-wage law. Pundits see these initiatives as a vote-boosting strategy for Democrats in key races. But advocates focused on economic justice simply see direct democracy as a straightforward way to deal with an issue politicians often ignore. Especially at the city level, but in states too, advocates go directly to the voters to raise the minimum wage because that’s an effective way to win more meaningful increases and side-step the effect of money in politics and special interests’ ability to water down legislation. Let’s do some math. If that individual purchased $100 a week in groceries, that would be $5,200 annually. Then, if the individual spent $300 a month for housing, that would be $3,600 annually. That means the individual has spent $8,800 of the $13,000 and we have not discussed an automobile, gasoline, money for medical bills, clothing, and the various insurances that are required. People cannot work at the state minimum wage and make their budgets balance. This also leads to imbalances in government budgets. According to a study by the right-wing Cato Institute, the typical “package” of welfare benefits for a struggling household in Arkansas is $17,423. (Caveat: the study casts a biased negative light on public spending for federal welfare programs. But actually, the deep unmet needs of benefits recipients should be seen as an indictment of the state’s entire package of budget priorities). Arkansas’s ballot measure would enact a three-step raise in the minimum wage to $8.50 by 2017, and affect roughly 168,000 people, or about 15 percent of the workforce, both through a direct income boost as well as broader economic ripple effects for other workers. The vast majority would be over the age of 20—that is, not of the mythical class of teenage after-school burger-flippers who right-wingers dubiously argue are typical minimum-wage workers. Collectively, the state minimum-wage initiatives would give a real raise to about 419,000 real working people, most of them in South Dakota and Arkansas, according to the Economic Policy Institute (EPI). Besides, the bean-counting debate among economists over the exact statistical impact of the minimum-wage hike is largely eclipsed by the overarching issue of inequality. And raising the incomes of the lowest-paid workers would help narrow the abysmal income gap by simply restoring the real value of the minimum wage, which has eroded steadily as the cost of living rises. The declining value of the minimum wage has played a key role in these trends. Setting the minimum wage at an appropriate level can help spur broad-based wage growth.… Such policies are needed to reverse those policies that have strengthened the hands of employers and undercut the ability of low- and middle-wage workers to have good jobs and economic security. Moreover, “a higher minimum wage would disproportionately affect women,” who make up the majority of benefiting workers (and would especially gain from a long-overdue raise in the subminimum wage for tipped workers). 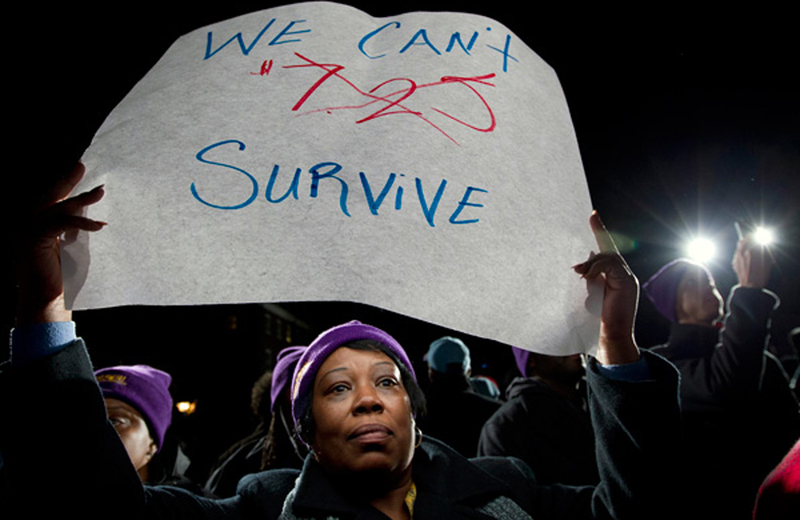 The wage boost would also disproportionately impact black and Latino workers. So many folks have family members, friends, neighbors who are working on that [amount], and they see every day the struggles they have to make a living…. Folks see it, they get it, they know it’s not enough and they know it needs to be raised. No wonder these ballot measures are polling better than many candidates: an initiative to give the poor a raise this election season is a rare chance to make your vote actually count for something.